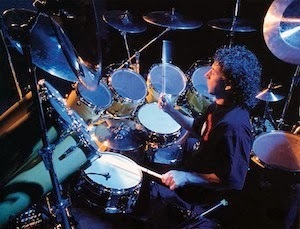 One of the world's best percussionists is the Englishman Simon Phillips; an ambidextrous drummer who follows in the footsteps of jazz greats Billy Cobham and Lenny White who helped to popularize that musical approach. Phillip's first came to this writer's attention via his work with Brian Eno and Phil Mazenera's group "801", and later, Peter Townsend and the Who. Phillips has continued to perform and record with a who's who of the musical world; he makes his return to the Bay area later this month, supporting Hiromi and Anthony Jackson in a sold out show at the SF Jazz Center of Franklin, before returning to Yoshi's in Oakland on April 1st with his own group, "Protocol II"- a sequel to his first solo group of the same name. Readers of my previous column will recall Hiromi's spectacular show at the newly minted SF Jazz Center last year; her return on March with Jackson and Phillips shouldn't disappoint fans either. Fourteen years ago, Phillips released the first Protocol album, and he deemed it was the "right time to record something new..."
"I had been writing and recording some material over the last few years but was not excited enough with the outcome. I wanted to do something very live and organic so as the NAMM show was coming up in January I was hoping that perhaps Andy Timmons would be attending. I called him and put my idea to him and he was way up for it and changed his plans to stay in LA a few more days. My next call was to Steve Weingart as, having worked with him on his last two solo CDs, I had formed a wonderful working relationship with him. He was also very excited by the project. Next was the question of who should take the seat of holding down those low notes. I had heard a lot about Ernest Tibbs and had spoken to him a few years earlier about some live shows, which he could not make. I gave him a call and he was also way up for it. So I booked time at Phantom Recordings – a week after the NAMM show – to see what we could do..."
"I had a bunch of demos ranging from ideas to complete compositions that I was not totally sure they were the direction I wanted to go in so I compiled those and sent MP3s to Andy, Steve and Ernest. My concept was that we would write in the studio and if any parts of these tunes worked we could use them. I was curious and eager to get playing to see how the chemistry of the four of us would work. The first tune we recorded was “Moments of Fortune” and I knew immediately this was a great band – great chemistry – a deep pocket and a relentless supply of musicality..."
"As it turned out most of the compositions were usable and only a few sections were omitted. We arranged the tunes on the fly and everyone contributed and it made for some very organic and vibe-y music. The days were long and tiring but the energy and creativity were amazing. We played live and only a few repairs, punches and overdubs were done. As we were recording this felt to me as though the Protocol concept was coming full circle and it was also 25 years since I released my first solo effort so it seemed perfect to be titled Protocol II. This project was a joy to work on and I want to thank Andy, Steve and Ernest for their wonderful energy, groove and improvisation captured on this recording...."